CALGARY - Wildrose Leader Danielle Smith moved Tuesday to snuff out a controversy surrounding her beliefs on social issues by affirming she is pro-choice and pro-gay rights. "When our members elected me they knew they were electing a candidate that was pro-choice and pro-gay marriage," Smith said Tuesday at an all-candidates forum in her Highwood riding in Okotoks. "The only way we're going to be able to become a mainstream, big-tent conservative party capable of forming government is to focus on the issues that matter to Albertans. If I am elected premier, a Wildrose government will not be legislating in areas of morality." Smith has faced criticism in recent days for failing to completely rule out a citizen's-initiated referendum on funding abortion if her party is elected April 23. However, she has stressed that she won't legislate on it, and she doubts that such a referendum would be allowed to proceed because a successful vote to de-list abortion would violate the Charter of Rights and Freedoms. Smith has also been criticized for her party's position on letting the courts decide conflicts around so-called conscience rights. Critics have charged that Smith has avoided disclosing her personal beliefs on the issues to protect her party's social conservative base of support. Smith told reporters after the two-hour debate that she may have misjudged public reaction to the issues which she says were obviously being pushed along by the Progressive Conservatives. "I guess perhaps I miscalculated in how it was going to be portrayed in the media, I guess, because I've been so open about what my personal views on this," Smith said. "Our members knew it and I didn't really see any reason to sort of wave it in everybody's face. It obviously is taking on a lot more of a life of its own, probably because it is being pushed along by the PCs. I think they see this as a way of demonizing our party and scaring the public." But when asked if she thought her comments clarifying her position would put the matter to rest, she said probably not. "I think what you see normally when a conservative challenger comes up, you see this very commonly that these kinds of issues are brought up to fearmonger," she said. "We saw it with Preston Manning, with Stockwell Day, we saw it with Stephen Harper so it actually doesn't surprise me that it has come up this election but it does disappoint me." Smith's beliefs may turn out to be a surprise to the Conservatives, who have suggested in recent days that the right-wing Wildrose is the party of old, white guys determined to resurrect regressive social policies. Tory strategist Tom Olsen told CBC-TV's "Power and Politics" show that the Wildrose is "the party of the middle-aged male who has lost control of the Progressive Conservatives because they have moved forward." And Tory campaign manager Susan Elliott suggested that women would be the primary target of citizen-initiated referendums. The Wildrose social policy was also the hot-button issue earlier on Tuesday during an all-party debate in Conservative Leader Alison Redford's home riding in Calgary, a warm-up to Thursday night's leaders debate. Speaking to about 150 students and party supports at Mount Royal University, Redford took aim at the Wildrose's policy on civil servants being allowed to opt out of jobs on moral grounds. "I am frightened of the Wildrose and I'm frightened of legislated conscience rights and I'm very concerned about what it will be in the future," she said to a loud cheer from the crowd. Wildrose candidate James Cole said he has talked to a number of voters on the doorstep and Redford is not what they want to see. "She's said several times in recent days that she's frightened by this election so much so that you'd think it was Halloween and not Easter. Perhaps she's frightened at losing her pay and perks," he said. "The people of Calgary Elbow that I've met on the doorstep don't want a premier who's frightened. They've told me they want a premier who's confident, poised and confident. 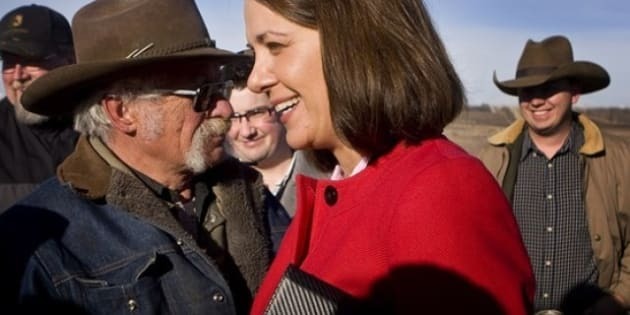 They want as premier Wildrose Leader Danielle Smith." Redford said Alberta is thriving under a Conservative government and challenged the other candidates to do better. "If we look in the rear-view mirror and wish for the good old days then all we're going to get back to is 2012," she said. The other candidates characterized the PC and Wildrose parties as two peas in a pod. "The PCs are running on change as they do every election and nothing ever changes. Wildrose is running on change but their type of change does nothing to improve things for working families," said NDP candidate Craig Coolahan. The Alberta Party candidate also scoffed at the Conservatives saying a party that has been in power since he was six-months old does not represent change. "With respect to my friend from the Wildrose, I think we need to understand who Wildrose is and where they've come from. Most of your current MLAs were elected as PCs and most of your organization were Progressive Conservatives in this province," said Greg Clark.